Over the past couple of months I've really noticed a difference in the amount of time my son is content to play by himself. As a stay at home mom who is also trying to run her own craft-based business I am particularly excited to have noticed that he is able to entertain himself for longer and longer stretches of time. As the last in my circle of friends to have had a child we were bombarded with second hand toys from friends and neighbor (glad to reclaim their own floorspace I'm sure). So, we have a lot of "stuff" to keep him entertained. We have a small slide/swing combo, a train table, a tunnel, mega blocks, a ball pit and a toy box full of all manner of things that light up and make noise. But, because my husband and I love to make toys, we also have, an equal number of handmade toys, those staples of generations long gone, pull along horses, wooden pigs, puzzles, knit stuffed animals and musical instruments. In the mornings, before we have our breakfasts we grab our "coffee" (I add flavored creamer to a glass of milk that he drinks from a coffee mug), and head down to his playroom. I make my to-do list for the day, and he says good morning to all his toys. I've begun to take notice of the different ways he plays with his toys - and there really is a huge difference in the way he plays with the "modern" toys vs. the old fashioned ones. When he is playing with the handmade toys, the ones that don't have buttons, the ones that don't light up and make noise he is more chatty, he gestures, he seems to be more focused and more deeply engaged. Compare that to the way he plays with a motorized farm tractor that "moos" and "bahhs" when you press on the animals heads - his interaction with that toy consists of continually pressing the animals to elict their wails. This observation got me to thinking about a radio program I caught earlier this year which discussed the role of imaginative play in childhood development and how its significant diminishment over the 20th century has seriously impacted a child's ability to control their emotions and behavior, resist impulses, and exert self-control and discipline. The article discussed how "playtime" is perceived by many parents and educators as "waste-of-time" and how the amount of time that used to be devoted to imaginative play has been replaced with structured lessons in an attempt to improve congnitive development. Turns out however, that old fashioned imaginative playtime was helping to develop critical skills, ones that help with self-regulation, self-disipline and social behavior, (ones that are pretty hard to teach). If the past 23 months is any indication, my son is going to be in pre-school in a blink of an eye. And I know that as soon as he enters the "system" I will be giving up a lot of control. His life will be more stuctured, it will become more competative, and I will be tempted to sign him up for classes and leagues, camps and lessons. I will do this because I will be told, and it will be implied that these things will make him a better student, they will make him a better athlete. So today I am making a vow to myself and a promise to him. No matter how hectic our lives become with activites, I will always make sure there is time to play. that is fascinating. Thank you. I've been meaning to listen to that podcast. I hated the noisy toys -- removed the batteries after bedtime. Behold, sans noise, they lost their interest. 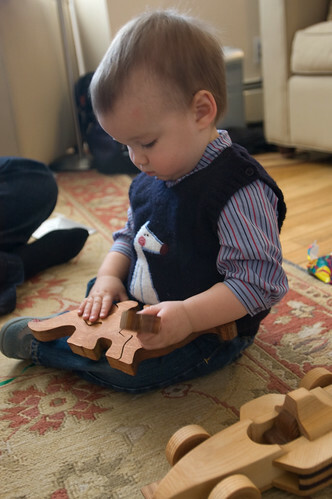 The BEST toy by far: blocks, all kinds. Cardboard, wood, even samples from architects show rooms. Also fabric scraps, and plastic animals. You go girl. Colleen you have it exactly right. Don't feel pressured to sign him up for twelve activities a week just because everyone else does it. Balancing imaginative play with activities HE is drawn to will serve him well. It's like Einstein said...Imagination is everything. It is the preview of life's coming attractions. I totally agree! Vlad likes to play with his blocks and figures a lot more than the noisy toys (thank goodness) and he does a lot of talking and interacting when he's playing with those. I just love it! You are so right, once the activities come, there will likely be less time for "just play" but for now, I love watching him play and "interact" with his toys. Great post! My girl is almost 15 now, and still, sometimes, she and her friends get out her blocks and build (secretly, with the door closed) elaborate homes for dolls and little toy creatures. It is such a big world inside one's head. Imagination rules.